Mobile devices offer convenient communication capabilities and have the potential to create intermediary support for ergonomically challenged users. With the global proliferation of increasing longevity, assisting the elderly and those living with impediments through human engineering and computing technology is pivotal to biotechnological attainment. To remain independently empowered, seamless integrations through efficient affable interfaces are required to provide sedulous location-independent and appliance-sensitive media viewing for the user. The Ambient Interface Design (AID) system assists with finding personal preferences and provides a synchronisation framework, coordinating connectivity across various environmentally distributed devices via sensor data mapping. Cooperative interface communication coupled with context awareness will be abstracted to a representation that facilitates optimisation and customisation to these displays. To overcome personal challenges in the efficient selection and acquisition of online information, AID mediates between the needs of the user and the constraints of the technology to provide a singular customised encapsulation of ‘ability preference and device’ for each authenticated member. A particular emphasis is the application of a human-centered design ethos. Ambient Intelligence (AmI) seeks to provide seamless integration of technologies to support a ubiquitous yet pervasive transparent framework for the implementation of electronic assistive environments. These ‘smart’, utilitarian electronic spaces are perceptive and responsive to the presence of an individual or individuals within a context domain (Aarts, 2005). Home, work and educational environments built on the ambient intelligence paradigm will offer flexible functionality through ubiquitous embedded computing facilitated by means of wireless communication and robust ad hoc networks. Smart behaviour associated with the technology is its ability to detect events, triggered by user actions within a designated milieu and to respond in an intelligent acceptable way to provide duteous ‘virtual services’ for that user. AmI utilises multi-disciplinary approaches to enhance greater human technology communication through distributed intelligence, data and information communication and amongst other disciplines it incorporates social science, psychology, ethics and law (Remagnino & Foresti, 2005). Moving the user to the foreground has acute legal and ethical implications that should be reflected in the design theory (Remagnino & Foresti, 2005). Personalisation of the user provides for adaptive and anticipatory utility within the ergonomics of the system. The objective of this study concentrates on user ergonomics through the development of a system that incorporates multiple display devices in the development of an Ambient Interface Design (AID) for the ergonomically challenged. The purpose of which is for user convenience in multiple settings in overcoming challenges met by those wishing to remain independent and living with disability through aging; hence a comfortable and productive environment is created. Through the use of wireless network technologies advanced mobile communication will be enabled with sensor components such as Radio Frequency Identification (RFID) readings to activate AID in a new context. AID will sanction the ‘firing up’ of Internet sessions on a selected device tailored to a user’s ability and preference, and continue with the seamless coalescence and switching to other appliances whilst perpetuating a constant session browsing experience for the user. This is achieved by caching the mobile web session and associated objects and relaying them to another possibly central repository, to facilitate viewing to commence as a new ‘continued’ session on a different platform. 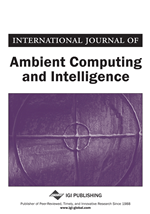 Personal Computers (PCs), Flat screens, smart mobile phones, and Personal Digital Assistants (PDAs) are proposed for this implementation encompassing sensor technology in ambient space supported by wireless networks over distributed locations. Thus the new session is permitted by utilising user audience preference or by identifying user movement from within an edifice and incorporating the information held in a database on each individual user regarding ability and preference. The ‘continued’ session will display the terminating screen of the previous device as the launch screen for the new contrivance - hence permitting persistent successive viewing for the user enabling Internet mobility with successful ergonomics.